Mussie Sibhatu, DDS, MS, is a trusted and talented dentist and prosthodontist at Laurel Smile Dentistry in Oakland, California. Dr. Sibhatu offers dental implants, crowns, bridges, dentures, tooth extraction, and many other general and advanced dentistry services. 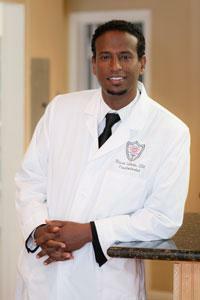 As a prosthodontist, Dr. Sibhatu has extensive training beyond his dentistry degree. Dr. Sibhatu attended University of Michigan School of Dentistry in Ann Arbor, Michigan, for both his dental degree and his three-year specialty training in prosthodontics. Dr. Sibhatu has advanced training in dental implants, removable dentures, cosmetic dentistry, and full-mouth reconstruction. He puts that training and skill to work every day by treating patients of all ages using state-of-the-art equipment and techniques. Dr. Sibhatu collaborates with other dental care providers and with each patient to create the best solutions for optimal dental health. He’s happy to welcome new patients at this time. Use the online booking tool or call Laurel Smile Dentistry for an appointment with Dr. Sibhatu today.